Posted on September 17, 2018 at 12:00 am. A fantastic time was enjoyed by all as the Nottinghamshire YMCA team turned out in their droves to celebrate this year’s Green Festival in Nottingham. The annual outdoor extravaganza, which took place from at The Arboretum in the city centre on Sunday 16 September, attracted visitors from all corners of the region who came together to sample flavours of everything good our wonderful city has to offer. With a presence from local coffee and jewellery makers to scrumptious vegan brownie stalls and dynamic music performances in the park’s bandstand – not even the occasional drizzly bluster could stop Nottingham’s enthusiastic citizens from having the best day. Keen to join in with the community fun, Nottinghamshire YMCA’s HR Director Andrea Shea attended with Marketing and Communications Officers Julian Phillips and Rachel Smith to raise awareness of the vital work the charity does for local young and homeless people. “It was clear that Green Festival goers are ethical, community-minded people who have a real social conscience for supporting others,” enthused Julian Phillips, who organised Nottinghamshire YMCA’s presence at the event. Our stall’s freebie badges – which were branded with the charity’s core values of respect, caring, responsibility and honesty – were quickly snapped up by children and adults alike. 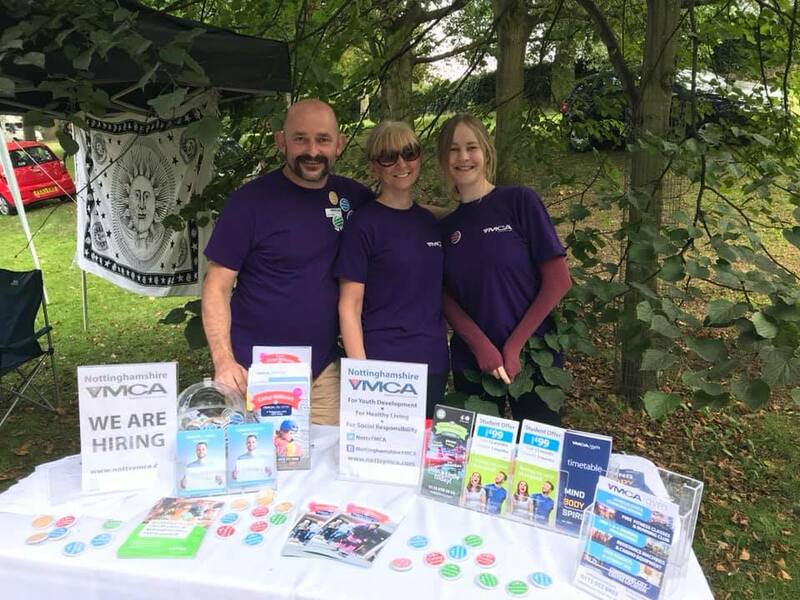 Digital Marketing and Communications Officer, Rachel Smith, said: “It was so lovely to see our wider Nottinghamshire YMCA team making appearances throughout the day to chat with the public and support their local community. “We were privileged to speak with a diverse range of individuals whose experiences of our services spanned from families interested in our Adventure Guides programmes to existing gym members and former residents who have now rebuilt their lives having received key worker support in our hostels.